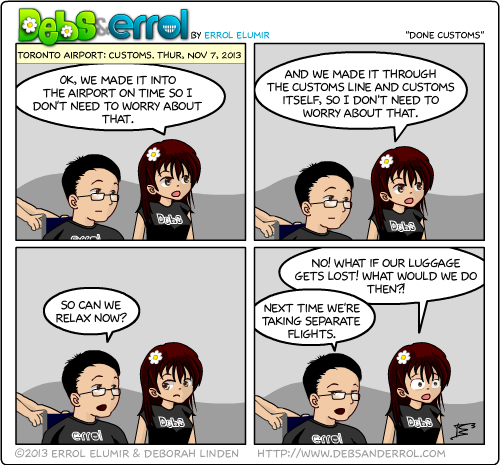 Errol: Non stop, was the worry. Non stop. Debs: Haha, I’d forgotten about this conversation. But what if they can’t find our hotel reservation? Hello, Anxiety, my old friend. It’s good to see you once again. All these doubts into my mind, creeping. I lay awake instead of sleeping. Hey…I’m not a nervous flyer because of the flying part. I like the flying part 🙂 Yay, moar flying! I love the flying part too!